As the horror of events in Manchester unfolded, my reaction was to remain steadfast in our commitment to our values. In fact, I believe we need to shout this out loudly and clearly so we are heard. Accepting our culpability in creating the conditions that breed such irrational hate and loathing is just not an option. Giving in to the arguments of the excusers of such hate can’t be allowed to go unchallenged. There is no justification. We need to give voice to those of us who abhor this slaughter done in the name of religion. We need to celebrate our society and stand tall. Freedom is a precious thing. We are its custodians for the generations to come. We must defend freedom above all else. With that comes the task of educating the next generation. Freedom is not something we can assume or demand, it needs to be fought for continually. That is why we need to give the next generation every opportunity to find their voice. But we won’t do that by deferring to them and avoiding difficult discussions. We need to challenge young people to argue from the point of view of a real understanding of the basic tenants of our society. Understanding the nature of democracy necessitates being taught our history, philosophy and even studying rhetoric. Only if we take pupils seriously will they have a chance of not only understanding the society we live but also potentially to shape it in the future. 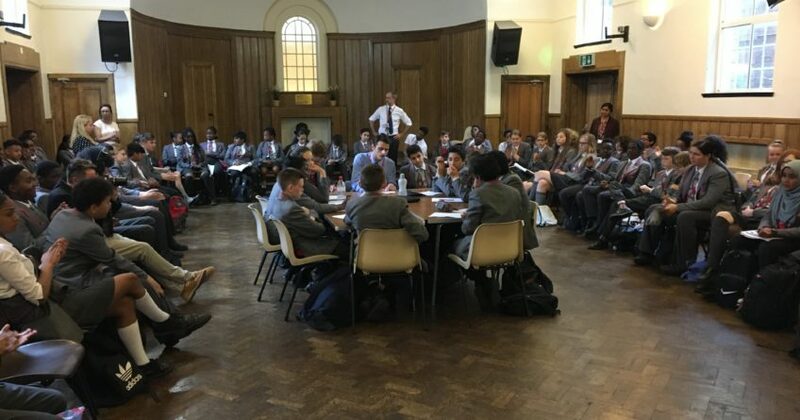 Holding our debating competition on Tuesday for all our Year 8 pupils was a chance for us to shout loudly that we as a school reject those who would try to make us cower. We stood tall and argued for democracy and freedom. We did this by challenging our pupils to stand up and argue their points in front of their peers. I only hope that we have been able to help them find their own voice and give them the confidence to believe they can stand up for what they believe in in the years to come. Your comments about democracy, especially during such emotionally heightened times nationally are interesting, particularly the point about not accepting culpability in creating the conditions that breed such irrational hate and loathing, because that is giving in to the arguments of the excusers. I would argue that accepting culpability doesn’t make us weak, neither does it affect our steadfastness in our commitment to the values we have. Since 2014 the U.K. has launched 1200 air strikes on Iraq and Syria. Democracy allows those who disagree with this to challenge it. Of course there is no justification in murdering innocent civilians to further any cause and we know that many of the terrorists are just using the word of Islam to satisfy their own wicked bloodlust and are plain murderers. However, I and many others feel that to deny any culpability plays to the advantage of the manipulators who brainwash those who become radicalized and the weakness of those who become radicalized. Whether this situation escalates only time will tell but I remain hopeful of a a eventual peaceful solution. Why do we need careers education in schools? Joanne Herlihy on How to decide on a grade? John Gillott on How to decide on a grade?